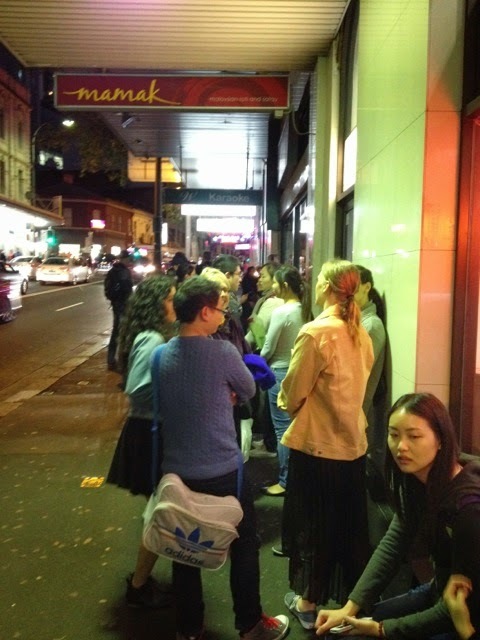 The first place I made a beeline for when I arrived in Sydney was Mamak. Many years ago (8 years? ), Mamak was a fresh face on the food scene and stole the show with their expert displays of roti dough twirling. It is really the best part of ordering roti canai; watching the roti canai maestro twirl the flattened dough in the air several times until it is stretched paperthin, then cooking the folded dough on a hot grill until it is flaky and crisp on the outside. It looks easy enough, but there are very few Malaysian eateries which have mastered this staple of the Malaysian cuisine. Mamak is a Malay word which refers to the Indian Muslim community, and also denotes the delicious food that this community is famous for. The range of Mamak food is difficult to find in Kuching, where I grew up, due to the very small Indian population, but we always have roti canai. Mamak’s roti ($5.50 each) was fluffy, crisp and just the right balance of chewiness. And there was the dhal and flavoursome curry (though a tad too salty and too spicy for me) to dip torn pieces of roti into. I was instantly transported. And unlike in Kuching where roti canai is only available for breakfast, at Mamak, you can get roti for lunch and dinner (they don’t open for breakfast). Every time since, whenever I visited Sydney, Mamak was a must visit. And when Mamak opened a branch in Melbourne, I duly made my pilgrimage. And year after year, the roti canai is just as good. Unfortunately though, the queues have gotten longer. The service at Mamak is efficient, orders and taken and the food hits your table within 10-15 minutes. The tightly edited menu means that it’s often a quick decision. 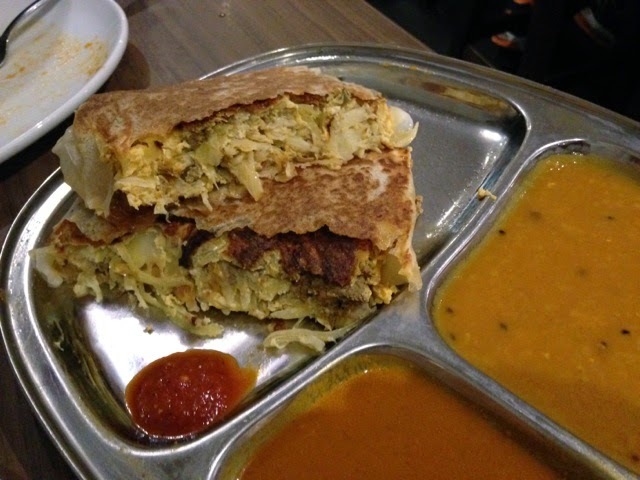 There’s the roti menu, – if you want a little more flavour, there’s roti bawang (with red onions), roti telur (with egg scrambled into the cooking roti), a mix of both, or murtabak (roti filled with meat, egg and vegetables). Although things move quickly when you’re in the restaurant, be prepared to queue at least 30 minutes during busy periods, longer if you’re in a group. There are no bookings, and everyone in the group must be present to be seated. We showed up 15 minutes before the doors opened for dinner service at 5:30pm, and the queue was already nearly stretching round the block. Yikes! There are also noodle & rice dishes. The nasi lemak is nice but mediocre. The satay is good and the peanut sauce is about the most authentic you can find in Sydney. There are also curry dishes and sambal vegetables for sharing, though I find the portions small for the price. However, I am addicted to Mamak’s rojak (a Malaysian salad). I grew up with Chinese rojak, where the chunks of pineapple, cucumber and mangkuang (or known here as jicama or yam bean) dressed with rojak paste (black prawn paste, belacan and hoi sin sauce). This is Mamak rojak ($14), the version served up by Indian hawkers, with shredded sweet, crispy mangkuang, cucumber and fried tofu drenched with a spicy peanut sauce and served with half a boiled egg and fritters. This is the epitome of deliciousness. There is also a good selection of Malaysian beverages, – teh tarik (sweet milky ‘stretched tea’ available hot or cold), kopi tarik and even the more esoteric ‘cham’ (a Hokkein word meaning ‘mix’), which is half tea and half coffee. We Malaysians can’t make up our minds, obviously. For dessert, try their chendol ($6). The chendol has been variable, but when it’s good, it’s pretty darn nice. The must-try dessert is definitely the roti tisu ($10), crispy single layered roti, sprinkled with butter and granulated sugar. This is probably one of the few places where I will queue, time and time again, for their delicious roti and Mamak rojak. Mamak has a strong following, and deservedly so.